Telkaif (Agenzia Fides) - The Kurdish Peshmerga militia is preparing to withdraw from the areas of Nineveh Plain still under their control, according to an agreement that in the next few hours will see Iraqi troops in the same areas. The news, relaunched by various Iraqi and Kurdish political sources, seems to wipe out the fears of seeing the Christian villages of Nineveh Plain become a land of military confrontation between Iraq and the independent Kurdish leadership of the autonomous region of Iraqi Kurdistan, which is still pursuing its plan of Iraqi Kurdistan secession from Baghdad, based on the plebiscite results of the pro-independence referendum promoted last September 25. The agreement on the withdrawal of the Peshmerga militia and the deployment of the Iraqi army in the Nineveh Plain - including the areas around the inhabited centers of Telkaif and Qaraqosh - is part of the overall agreement reached on Sunday 29 October by the military and political representatives of Baghdad in the meeting with Peshmerga military leaders and political representatives of the autonomous region of Iraqi Kurdistan. This agreement also involves the deployment of Iraqi military forces of the border passage of Habur, which borders with Turkey, a strategic spot also to control the export of oil produced in the area of Kirkuk. The announced, painless, passage of deliveries between Peshmerga troops and the Iraqi army seems to be avoiding for the moment the risk of a large-scale conflict between Baghdad and the current leadership of the autonomous region of Iraqi Kurdistan. In recent days (see Fides 30/10/2017) both the Chaldean Patriarchate and the Syriac Orthodox Patriarchate had unanimously expressed their concern for the recent events registered in the Nineveh Plain, the area of traditional roots of Christian communities that has become the object of territorial disputes and even military confrontation between the central government of Baghdad and the autonomous region of Iraqi Kurdistan. 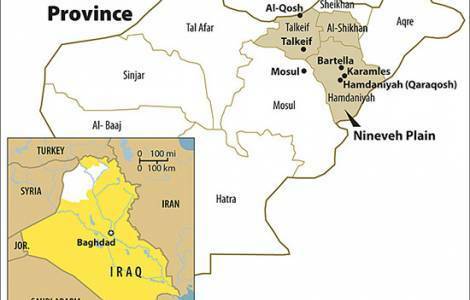 In a document published on Sunday 29 October to outline his "vision" on the future of the Christian cities of the Nineveh Plain, the Chaldean Patriarchate recalled that "the jurisdiction over the Nineveh Plain, which was unified, stable and secure until 2003, is disputed today between the Iraqi government and the Kurdish forces.